You can buy my bread at Farmers Market in Bozeman, MT and directly at my little shop. Check my Home page for details! My preferred way to store bread for up to three days is on a cutting board with the cut face down on the board to prevent it from drying out. This also keeps the crust in tact. If you are saving your bread longer then a few days, I recommend you wrap it in Bee's Wrap. Yes! I usually wrap mine in plastic wrap or Bee's Wrap. It will keep for a long time but I recommend eating it within three months. How do I reheat my frozen loaf? Preheat the oven to 375F. Take your loaf out of the freezer and unwrap it. Spray or brush the bread with a generous amount of water to make the crust moist but not soggy and place it right on the rack in the oven. Heat for 25-30 min until warm on the inside. You can use the same process (less time in the oven if not frozen) of reheating for a loaf of bread in any state, whether it be a day old or 6 days old. You might be amazed at how a loaf of bread can be brought back to life with a little heat. Which of your loaves are sourdough? All of STELLA bread is sourdough bread. Another term for it is naturally fermented bread or levain bread. I use all those terms to describe my breads, which are all made with the old European methods of natural fermentation. I like to encourage the lactic acid in my breads, which creates a flavor that I really enjoy, but is less sour than a lot of store bought sourdough bread that has sourdough flavor as an additive instead of being made with this old method and therefor is lacking all the benefits of sourdough bread. Higher nutritional value- As is true for any fermented food, the bacteria present in the sourdough starter eat the starches and sugars in the grain. The result is a lower carbohydrate content of the bread, which is helpful for keeping blood sugar levels regulated. It also allows our bodies to absorb more minerals and vitamins from the gains. 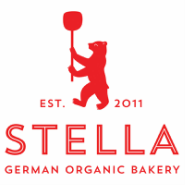 Breaks Down Gluten- The longer fermentation times of STELLA bread breaks down the gluten (proteins) into amino acids, making it easier to digest. This is why some people with gluten sensitivities are able to eat naturally fermented wheat breads. Natural Preservative- There are two acids present in sourdough bread. One is the lactic acid, which creates a mild tang, like yogurt has, this acid helps predigest the grain. The other one is acetic acid which inhibits the growth of mold and increases shelf life of naturally fermented breads. Neutralizes Phytic Acid- The bacteria present in the sourdough culture help activate phytase, an enzyme that breaks down an anti-nutirient preset in grains, beans and other seeds called phytic acid. This acid is known to strip your body of vitamins and minerals and can be hard on your digestion. Essentially, the ancient art of naturally fermented bread creates a healthier and more delicious loaf of bread. Try for yourself by ordering a loaf today! ​You don't see the bread you love anywhere? You have an event or birthday and want bread for it? I bake special orders when ever I can. Contact me to talk about your special wishes and I will try my best to make them happen. I forget to pick up my share, now what? Call or email me as soon as you realized you forgot! If I don't hear from you within 24 hours I will find a good home for your bread. If you have to leave town unexpected and can't come to pick up your share or don't want me to drop it off, just let me know and we can arrange something for you (freezing, giving it to friends, letting my husband eat it...). As long as you communicate with me I try to accommodate you as much as possible. After all, I bake the bread for you and I want you to enjoy it! Generally, just try to avoid this by writing it into your calendar or setting a reminder on your phone, because it makes me sad to see left over bread at the end of the day.